Zone 6 may seem to lie at the edge of the universe to many Londoners, but those prepared to extend their horizons to the outer reaches of the tube network will be rewarded by a visit to the newly restored Uxbridge Lido. Originally built in 1935, this pool’s future was thrown into doubt in the eighties, from when it opened sporadically until closing its doors in 1998. 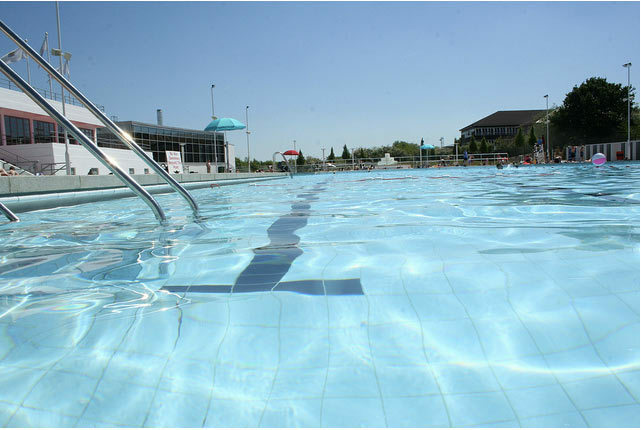 As the lido lay in disuse for over a decade, many people feared it might never return to its former glory, but earlier this year it was opened by Boris Johnson as part of the new Hillingdon Sports and Leisure Complex. Perhaps mindful of the challenge of integrating the old lido into this vast entity while maintaining its own character, the designers here have rejected the bright reds, yellows and blues found at some other lidos in favour of a more subtle look. The unusual twelve-sided ‘star’ shape of the 67m pool, and fountains at each end, ensure that the lido retains a unique identity in its new incarnation. Aside from the paddling pools at one end, the water is unheated, meaning that on our visit (on a classically overcast, chilly and rainy August day) the lido was virtually deserted. But in more amenable weather, the pool has much to offer both fitness and recreational swimmers (there is plenty of space at the poolside for lounging and sunbathing). Just be warned that the water in the showers is as cold as that in the pool. While in the main the lido works as a separate unit to the main sports complex (you pay at the main desk, but the lido has separate outdoor changing, lockers and showers), the exception is the cafe, for which you’ll have to return inside and past the turnstile. While it would be nice to be able to sip a coffee by the side of the pool rather than returning to the rather functional leisure centre to do so, it would seem petty to gripe about such details. Having been out of use for so long, and with an indoor 50m pool next door, it is a marvel that the lido has been restored at all, and that it holds on to so much individual character is a further cause of celebration. This pool is a real asset to this part of London and deserves to attract visitors from these parts and beyond. Hillingdon Sport & Leisure Complex, Gatting Way, Uxbridge UB8 1ES. Tel: 0845 130 7324. Prices: adult resident, £5, adult non resident, £5.60. Download full prices PDF from website. More photos here.